Applied was retained to upgrade the electrical systems at the Belmont and Southport Advanced Wastewater Treatment Plants. Phase I of this project involved the replacement of obsolete and corroded electrical service equipment for the two treatment plants. This included the replacement of seven indoor 480V switchgear line-ups, 12 outdoor 480V switchgear line-ups in environmentally controlled buildings, two 2400V unit substations, two 480V unit substations, four indoor motor control centers, and two outdoor motor control centers in environmentally controlled buildings. Applied also designed the addition of two new 13.8 kV switchgear line-ups and two new 13.8 kV interrupter switch line-ups to provide automatic transfer and isolation capabilities to the primary distribution system. Work involved medium and low voltage switchgear, protective relaying, transformers, low voltage switchboards, motor control centers, motor control schematics, and temporary power planning. 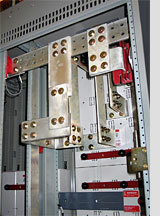 Equipment arrangements and specifications were developed to be included in a switchgear bid package. Submittal drawing review was performed to assure compliance with the specifications. The temporary power planning was extensive and was developed to maintain service to critical buildings with minimal downtime and interruption. Engineering support was provided to the owner for the bidding and construction phases of the project. Construction for Phase I of this project was completed in late 2005. The estimated total construction cost of Phase I was $5,815,000. Phase II of the project represents a continuation of the design innovations developed in Phase I and bundles a diverse variety of electrical projects under one design contract. The project scope includes bus duct replacements, switchgear replacements, instrumentation upgrades, HVAC scrubber installations, and SCADA monitoring system installation. Construction has begun on the early design phase documents and will continue through 2010.